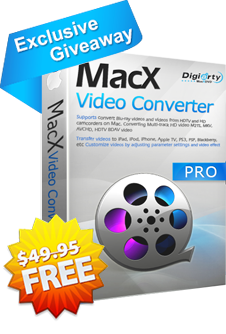 Exclusive Giveaway for SCforum's members - MacX Video Converter PRO for FREE !!! Topic: Exclusive Giveaway for SCforum's members - MacX Video Converter PRO for FREE !!! MacX HD Video Converter Pro for Windows - Convert among HD & SD videos on Windows (10) and Convert Video to iPhone, iPad, Android, Google, Windows phones, PS4, etc. MacX HD Video Converter Pro for Windows is a full-fledged HD video converter that gives windows users full control over SD, HD, and 4K ultra video files. It supports 370+ video/audio codecs, including MKV, M2TS, MTS, AVCHD, AVI, MP4, WMV, MOV, FLV, RMVB, WebM, Google TV, etc. The 86X faster video converter permits you to select a specific output for your Apple devices i.e. iPhone 6s/6s Plus/6, iPad Air/Air 2, iPad Mini 4/Mini with Retina, iPod, as well as Android and other players like HTC, Samsung, WP8, Surface, PS4, Xbox, etc. On top of that, other bonus features of the video converter for Windows PC allow you to download YouTube video, make photo slideshow, and edit video with hardly a glitch. This video converter makes perfect compatibility with Windows 10( 32& 64 bit), Windows 8 (32 & 64 bit), Windows 7 (32 & 64 bit), Vista (32 & 64 bit), Microsoft® Windows 98, NT, 2000, 2003, XP. Best all-in-one video converter for Mac to download, convert, edit and record videos. With 320+ video and 50+ audio codecs supported, it helps you to convert 4K UHD, MKV, AVCHD, M2TS, MP4, AVI, WMV, MOV, VOB, etc to any video or audio format of your choice for enjoying in iTunes and QuickTime, editing in Final Cut Pro and iMovie, sharing on YouTube and Facebook, or playing on the latest iPhone 6s/Plus, iPad Air 2/Mini 4, Android, Samsung Galaxy Note 5/Edge, HTC, WP8, PS4 etc. It also enables you to download videos and music from 300+ sites and convert YouTube to MP4, MP3 for offline playback. 83X faster, no quality loss. Re: Exclusive Giveaway for SCforum's members - MacX Video Converter Pro for FREE !!! Giveaway version doesn't support free upgrade. Yes F., you have a right about this... but, simply turn-off Upgrade function - will keep PRO features permanently.